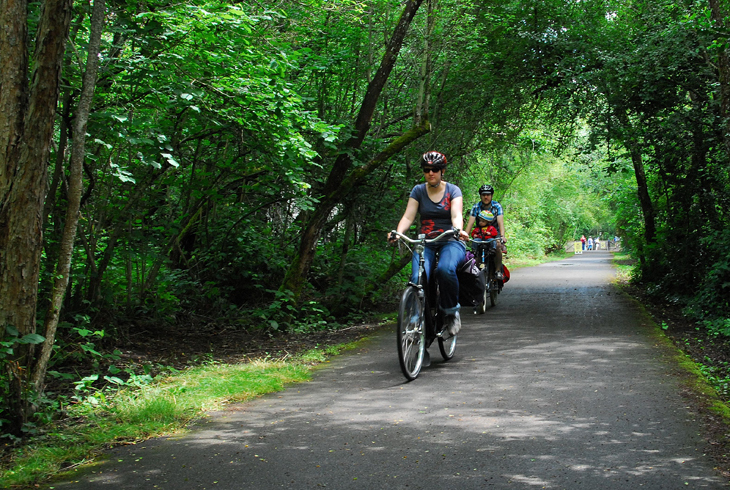 The Fanno Creek Trail is just one of many scenic adventures that await on more than 70 miles of trail located throughout the district. THPRD’s 70-mile urban trail system helps residents and their families enjoy the outdoors and spend quiet time away from the rush of today’s world. THPRD trails also provide a great way to get to work, the grocery store or to a friend's house while getting exercise and living a healthy lifestyle. All 3,600 acres of THPRD properties, including our parks and trails, are smoke-free. Check out our Nature & Trails Map and begin planning your next trip! Free printed copies of the maps are available at most THPRD facilities and events. Our partner, Access Recreation, has created a guide to help you know what to expect when you visit several key trails around the district and the region. The photos and maps in the link provide information that people of all abilities can use to determine if the trail meets their needs or desired experience. It also includes a video of how to get to the Tualatin Hills Nature Park from public transportation. Click here for more details. To use our trails as a way to get out of the car and still get where you need to go, the following resources will help with ideas and safety information. Connect to public transit with TriMet. Drive Less, Save More has tips about commute options. The Westside Transportation Alliance provides information beyond the trail system. The Bike Beaverton bike route map is now available. You can download a printable version at the links below or pick up a copy at City Hall or the Library.